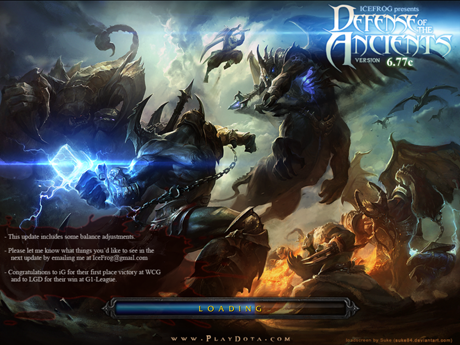 DotA 6.77c Download - Official Dota 6.77c Map. Just like we've told you guys several days before on this post, DotA 6.77c is indeed coming on this month. Today, the map already available for download. IceFrog made several changes on the Tranquil Boots. On heroes, as predicted, Drow Ranger's Markmanship and Nerubian Assassin's Spiked Carapace are nerfed. Check out the changelogs and the download link below! It seems IceFrog is listening the complaint about Drow Ranger and Nerubian Assassin from some competitive players. Anyway, let's hope this map will be a sign that DotA 6.78 will be coming soon after.. Mean while, enjoy the new map guys! Have a nice weekend! PS: Wanna be the first to hear the new DotA map? Subscribe our feed or follow our Twitter, Facebook and Google Plus account, we will let you know as soon as the map released! Ah.. Drow Ranger is my favorite! Why you nerfed it IceFrog??? How is that gonna help against heroes ?? you cant win a game just by farming, specially that Drow has quite a poor stat growth and can be easily nuked by multiple nukers. Drow already has 60 percent slow and her ulti gives her 40 60 80 agi thats to compensate for her poor agi growth. hey..this map for dota 1 or 2 ? i have done download this map but after i installed, i try run dota and put insane enemy(AI)but no enemy hero ? why ? that is written on your blog.Keep the tips coming. I liked it! reading it, you could be a great author.I will make certain to bookmark your blog and will come back down the road. much up veгу fast! Whаt web host are you using? Thanks for finally writing about > "Dota 6.77c Map - Official DotA v6.77c Download & Changelogs" < Liked it! Hi, I do think your website may be having browser compatibility issues. it looks fine however when opening in I.E., it's got some overlapping issues. I simply wanted to give you a quick heads up! Besides that, great blog! rilis dunk final mapnya.. ga pake v++, lsg finalnya yg ga pake bug dsb. It's going to be ending of mine day, but before finish I am reading this great article to increase my experience. read more, Please do keep up the great work. i think centaur needs more percentage of its return ability. can you change the physical apperance of centaur in 6.78 map? Is it possible? Thanks for sharing your thoughts about nationwide auto. it seems to be great. I've bookmarked it in my google bookmarks. Hi there, simply turned into alert to your weblog thru Google, and found that it's really informative. I'm going to be careful for brussels. I'll be grateful if you proceed this in future. The clarity for your publish is simply spectacular and i could think you're a professional on this subject. Well with your permission let me to seize your RSS feed to stay updated with forthcoming post. Thanks one million and please continue the enjoyable work. An impressive share, I simply given this onto a colleague who was doing a little bit analysis on this. spending the time to debate this, I really feel strongly about it and love studying more on this topic. The other created a solution: gгain-fеԁ cattle and poultry and prοceѕsеd packageԁ fοoԁs. why the hotkeys that i downloaded wont work ? sorry to those using me. but i am noodie now. pick me if u wanna die.